Journey into Awesome Has Been Featured on Freshly Pressed! 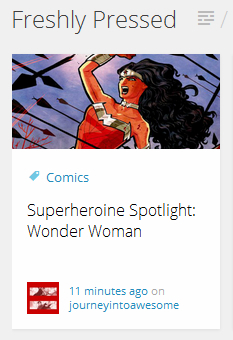 Seriously though, it’s an honor to have been featured and I’m overwhelmed with all the positive feedback I’ve gotten on my Wonder Woman spotlight. Thank you all for your congratulatory comments and kind words. If you’re one of the site’s many new visitors, thank you for stopping by and I hope you’ll stick around! Congratulations! I remember when I was featured, I was OVER the Moon esctatic! Keep up the good work! Please feel free to check out/follow my blog!